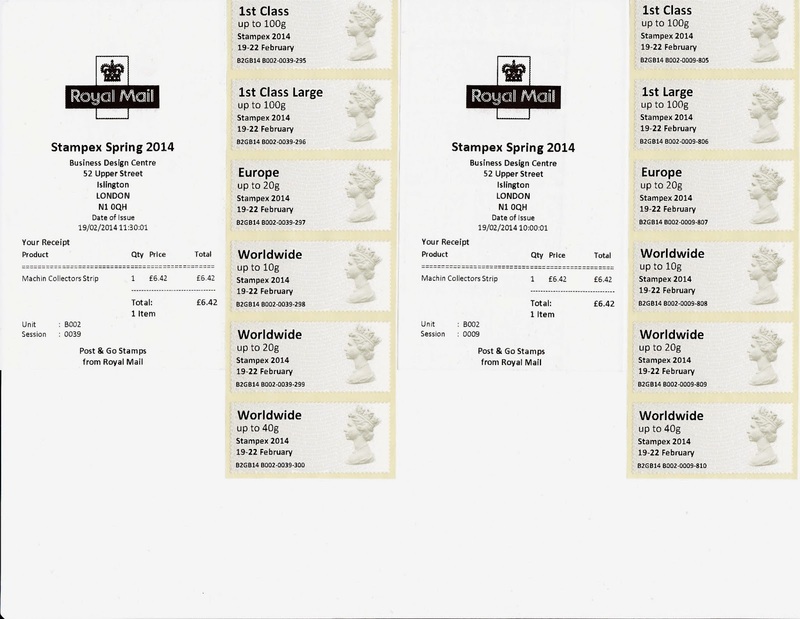 Spring Stampex 2014: The Good, The Bad and The BPMA! Greetings! An interesting day in London yesterday at Stampex and the BPMA. This is a quick round-up as we have a lot to do - which I'll explain later. NOTE: I know many people will or have read this and then contact their usual supplier for all the versions that they didn't ask for before Stampex. Most of us bought what we could either on pre-order or from the machines. If two versions of a stamp were available on pre-order (B machine) and we only got one, then that can't be changed! If two versions were available at the public machines and this wasn't discovered until later, then it can't be changed. Our customers will get what they asked for and if we happened to obtain other variants, then they will be offered. Aside from that, it can't be done. Have faith in your suppliers: they can't work miracles! Machine B2 - Machin with additional inscription on both reels, all 4 days. I thought it was clear from this that ONLY the Machin would have an additional inscription (or overprint), not the flags, not the new pictorials (which never have additional inscriptions). Some people seem to have been looking for the Stampex 2014 inscription on the others. Sorry if it wasn't clear! It does get complicated at times. Wednesday visitors soon found out that, unlike in previous events, there were no Post and Go stamps being sold over the Royal Mail counter, apart from the Spring Blooms packs. So all publicity about 'B' machines applied only to pre-orders. And the only people who knew how to pre-order were we dealers! The omission of the B machines from the back-office meant that not only could collectors not obtain them, dealers could not get more than their original pre-orders. There may well be good technical reasons for the change, but this hasn't been explained yet. It suggests to me that some of the changes had been driven by the software supplier rather than by Royal Mail. On the positive side, I talked to Royal Mail about the fact that - for us - arrangements for and availability of Post and Go stamps seemed to change for every Stampex (one time we couldn't pre-order multiples of 1st class, only collectors strips and sets), and I've been told that lessons have been learned and things will be regularised. These new machines were not A2, A3 and A4 as originally announced but A3, A4 and A5! I didn't try them all, but from what I bought and what I have seen on eBay A3 had Machins and flowers, A4 had Machins and ? (probably flowers), and A5 had Machins and Flags. And I put this in the BAD because it shouldn't have happened, there should have been greater control and consistency. Responding to a question sent as a comment, I find that the overprinted Machins I have from A5 are without year code, but those from machine B2 are coded MA13. So not only were B machine stamps not sold over the counter, but the ones that were produced are different to those sold from the public machines. What a farce: I'm now faced with customers wanting both types but I have very few spare of either type. Also, very pleased to meet Sally from Jersey Post who is very enthusiastic about the Post and Go system: more news from her, and maybe Guernsey Post, ere long! I'm told that 'the machine broke down a few times' but I suspect that may have been reel exhaustion as much as anything, as demand was great especially from European dealers, who were still present when I went at 5pm on Thursday (when the machine was reloaded once again). Demand was given a boost when the Machin replacement rolls were coded MA13 - the dealers wanting just as many as before all over again. "So you [a dealer] are able to sell on at a profit when other individual customers later actually can't get any of them either. And individual collectors have to ask 'politely' for you to move over when you are printing out hundreds to make a profit for yourself." "We only have ourselves to blame, if collectors didn’t want completeness and dealers eager to meet demand, this wouldn’t happen." I think we will find at future events that only one version of each base stamp will be available: none of this MA12/MA13/MA14 all available at once. The staff at the BPMA have their normal 'day jobs' to do, and they may rue the days when there are changes to the Post and Go machines. They can't be expected to 'police' the queues to ensure that no one person or group monopolises the machine causing lengthy queues. One saving grace of the new machines with their greater and faster output per payment is that such clogging will be vastly reduced. Due to lack of time I didn't get any BPMA stamps yesterday but I hope somebody will get them for me today. As you can see this is from session 0258 on machine A5. On eBay I've seen session 247 with the correct inscription, and those I bought yesterday had the correct inscription. So how is this explained? Evidence from several buyers suggests that this error started around 2.30pm and continued for the rest of the day, ie 7pm. The time on my receipt is 21:39:29, but in reality it was about 3.15. [Session 247 was about an hour earlier.] This might suggest there had been a breakdown during that time requiring some resetting, but that doesn't explain why the text changed! Session number was 267 timed at 22:00:16 (but actually about 4pm) and also shows the wrong caption. The Royal Mail stand didn't have much in the way of new stock - all the 88p regionals were from the original printing, for example. But there were adequate supplies of 1st class Large MA13 sheet stamps, and they are back on stock. If you need date blocks or cylinder blocks please contact me! We're moving all our operations to a new server - that's mail and website. Mail has already moved - you won't have noticed (I didn't! ), and the website will start early next week. The old shop site is nearly empty and closed (yet we still had an order yesterday!) and stock is now at shop.norphil.co.uk which is hosted independently. This may mean that I cannot deal with emails and orders quite as quickly as usual, so please bear with me and all should be well in a couple of weeks. If you notice anything missing, broken links, etc, I really would appreciate being told so that we can put things right. Do you know if any Stampex Machins were issued with the MA13 code? The ones I purchased had no code. I wrote the blog before I had examined my purchases, so a further update is needed! The stamps from Machine B2 are MA13; those from A5 have no year code. All my stock of flags is MA13, the flowers are MA14 and the Jersey stamps have no code. So I have far Machins from A003, A004 & A005 with & without MA13, Union Flag from J001 with & without MA13. Flag from A005 only MA13, however today it seems they now only have no code stock, there was mention of some B stock with an MA14 code. The A005 error I have on MA13, they were still being dispensed at 5pm. If you are willing to send me scans (ian@norphil.co.uk) I'll be pleased to put them on show! So - would the last person still collecting post and go stamps in all permutations please close the door and turn off the lights as you leave. We only have ourselves to blame, if collectors didn’t want completeness and dealers eager to meet demand, this wouldn’t happen. The same could be said for the Machins with their security overprint, and the various permutation of mis-alignment. Hopefully this game of imprint roulette which started with the second class stamp during the Christmas tour will only be a short term thing, and is only happening in order to use up existing stock and minimise wastage once the NCR machines are introduced, as they have different cores (on the face of it not a bad decision, as you just know someone either on purpose or by accident will get the rolls mixed up). Otherwise it could be nothing more than a revenue raising exercise, increasing the money earnt by machine by about 50%. Some may view is either to generous or to cynical, the answer is probably yes. I was that person who went on the machine at 10:00 am on Friday morning. I had been there on the previous day at 5:10pm until 6:20pm and the machine only worked for two transactions during that time, although I tried about 25 times to get it to work. I arrived at the BMPA again at 9:10am on the Friday morning to see if the machine was working and was told that I was not allowed on the machine until 10:00am, so I sat waiting for 50 minutes!! I was picking up items for seven people, to cut down the number of transactions required and the number of people in the queue at the BPMA. I was actually on the machine for 42 minutes, which averages out at 6 minutes per person, but I had already spent 2 hours and five minutes waiting for the machine to work!! I also did not exhaust the Machin MA13 roll as stated, as the next person purchased at least 10 strips after me without a problem. When I visited the BPMA on my first visit on the morning of the previous day, someone was on the machine when I got there and I waited patiently for over 30 minutes (this is on top of the 2 hours and 5 minutes mentioned above), but I accepted this and didn’t moan about it!! I had travelled 200 miles to visit both Stampex and the BPMA for only a couple of days and after my third visit there in two days, I needed to complete my purchases for the seven people I was picking the items up for! Perhaps during these busy periods when Stampex is on and when there is a new overprint, the BMPA could relax their rules, to let customers use the Post & Go machine as much as possible, ( i.e. before 10:00am), and so help to help reduce the waiting time for others. They might also be able to have strips available for customers to purchase over the counter for those who only wanted to buy strips in small quantities. However I think the most important point, (during this high peak demand when Stampex is on), is that the machine should be in good working order and have an adequate internet connection, as that is what kept me and many others waiting excessively and this had a knock on effect on other customers on other days. On a final note, don’t just moan about the situation, try to be patient and offer a constructive suggestion so that the problems can be minimised for next time. Remember I waited in the queue over three times longer than you did!!! Dear Ian, I am, like you, a big fan of Sergio Leone and Clint Eastwood - and I can comprehend the temptation of the analogy. But you should better have heard second (or third) opinion of what had happened than publishing such polemic incriminations. I am a German stamp dealer specialized in Post & Go stamps and frequently in London. And I feel offensed by this evaluative article though I was not in London that day. I spoke to the German dealer mentioned in your article and two other stamp professionnels present at that tine at the BPMA: none of the accusations is true! All of the polemic incriminations are made up! Thomas, thank you for your comment and your explanation of the situation. As you will appreciate, I was at Stampex and the BPMA on Thursday and most of the reports that I based my blog post on were from people attending on Wednesday. What I reported was not just one person's perspective - but indeed maybe several people repeated the same false accusation. But I wasn't there, and I have simply reported what I was told. I'll make sure that the people who told me this are aware of your concerns, and invite their comments. I know that there was a German dealer at the BPMA on Thursday (late about 4.30) who did allow my friend to buy some strips immediately after the machine was re-stocked - that is, when the buying process had already been interrupted. Most dealers here will want to make large purchases from the machines. And most British dealers will, if asked, make way for a few minutes to enable collectors who want to buy only 2-3 sets to get to the machine. We are friendly to others - they may buy from us sometime ! But as you will see from the 22.0.13 - 12:03 comment, not all British dealers are blameless. The benefits of the new machines at Stampex is that they print faster, they permit a much larger order per transaction, and will not take an order for more stamps than are on the roll. So maybe the problems will not recur, other than at BPMA. Dear Ian, many thanks for your quick reponse. You may wonder, but the German stamp dealers do have the same attitude of letting customers requesting small quantities pass by, implied the other clients queeing up agree and the request is brought forward politely. When I was at the BPMA on wednesday morning I bought half of the quantities needed only, because of many people waiting behind me .- resulting in that I could not buy these items later on. Hi Thomas, thanks for coming back. I'm pleased that dealers and collectors can accommodate each other in this way. There may be an occasional dispute, but hopefully that will be dealt with easily. I hope in future that there will be only one type of basic stamp - not MA13 now, and a different one later. That would make things much easier for everybody. Now that I have read other comments and emails I have edited the original report, and apologised to German readers. Clearly some people over-reacted and others just don't realise that we dealers have to supply collectors who can't make the journey. I'm closing the post for further comments so that there will be no more animosity. I hope to meet you next time maybe! Hopefully the Salisbury Stamp Show will either the original printing or the MA13 version not both and no errors. This is turning into a comedy of errors, now errors from the back office machines are turning up on eBay.